Saturday, September 14th 2018 - Fort Myers, Florida Training Workshop at Mountain Tiger Dojo Shihan Joseph Adriance Mountain Tiger Dojo is very happy to announce that we are hosting another in house training workshop by Shihan Joseph this year. We are very grateful to Shihan Joseph for traveling to our dojo again and providing us with training based on his immense knowledge in Bujinkan. As always, M.T.D. welcomes Bujinkan student’s from all walks of life, but we especially want to open this invitation to the Bujinkan students from Golden Meadows, Louisiana and Daytona Beach, Florida. Qualifications Required: You must have the yearning and determination to obtain this knowledge. You must also have the respect to keep it, share it or use it for its intended purpose! Therefore, Come one and all! Knowledge is open to everyone who is qualified. Saturday, June 8th 2019 - Louisiana Training Workshop Shihan Joseph Adriance Mountain Tiger Dojo appreciates this year’s invitation to the June Louisiana Training Workshop. Sensei Robert and some of the MTD students are looking forward attending. We fully support Golden Meadow as they never cease to provide great workshops, food and fellowship! Thank you! Saturday, March 2nd 2019- Del Rio Training Shihan Joseph Adriance Sensei Robert traveled to Del Rio, Texas for another great training experience with Shihan Joseph. Focus was on Bujinkan Budo Densho Koto Ryu Taijutsu No Kata and Bujinkan Budo Densho Gyokko Ryu Taijutsu No Kata by Carsten Kuhn. Update: Thank you Shihan Joseph! You and your wife’s kindness and knowledge are certainly a great gift to us all. Saturday, December 8th 2018 - Louisiana Training Workshop Shihan Joseph Adriance Mountain Tiger Dojo appreciates this year’s invitation to the December Louisiana Training Workshop. We look forward to attending the event. Update: Thank you Shihan Joseph! You never cease to astonish and create a continuous yearn for more! Thank you to everyone from Golden Meadows involved in preparing the workshop and the hospitality received! Saturday, September 15th 2018 - Fort Myers, Florida Training Workshop at Mountain Tiger Dojo Shihan Joseph Adriance Mountain Tiger Dojo is very proud to announce that we are hosting our first in house training workshop by Shihan Joseph. We are very grateful to Shihan Joseph for traveling to our dojo and providing us with training based on his immense knowledge in Bujinkan. Update: A great first Mountain Tiger Dojo Workshop! An amazing download of information from Shihan Joseph, a warm gathering of fellowship from all the Bujinkan students (local and from other communities) and a proud moment of promotion to black belt for one of our most dedicated students. Congratulations Lex! Can’t wait to watch the MTD Workshops grow over the years! A big thank you to everyone! Saturday, June 10th 2018 - Louisiana Training Workshop Shihan Joseph Adriance Mountain Tiger Dojo appreciates this year’s invitation to Louisiana. We look forward to attending. Update: Mountain Tiger Dojo would like to thank Shihan Joseph and everyone from the Golden Meadows dojo for another great training workshop and their hospitality as always. Saturday, May 5th 2018 - Del Rio Training Workshop Shihan Joseph Adriance Sensei Robert is excited to be traveling in May to Del Rio, Texas for another great training workshop with Shihan Joseph. Update: Mountain Tiger Dojo would like to thank Shihan Joseph and his gracious wife for opening their home to provide yet another great training workshop and the kind hospitality that was included. Saturday, December 9th 2017 - Louisiana Training Workshop Shihan Joseph Adriance Shihan Joseph trained in several martial arts before joining the Bujinkan including Judo, Karate and others. 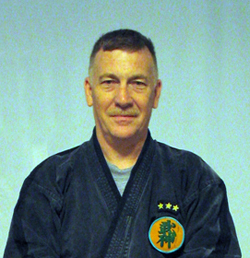 He has been training in the Bujinkan since 1979. Sensei Robert and some of our senior students are excited to be traveling to Golden Meadow in Louisiana for a training workshop with him on Saturday December 9th. Update: Mountain Tiger Dojo would like to thank Shihan Joseph and everyone from the Golden Meadows dojo for a great training workshop and an amazing level of hospitality.